Dogs and Ireland go hand in hand and we at the Native Dogs of Ireland have been gathering since 1985 to participate at the Irish Fair and other Irish Cultural events each year, not only to share our love of them but also to educate and inform those lovers of the Emerald Isle what the Historical uses of each breed was. Under our tents you will find at one time or another (Not all Breeds are in attendance each or all day) a variety of the 8 Native Breeds of Ireland. From the several Terriers, including the Irish, (Red or Black & Tan) Soft Coated Wheaten, Kerry Blue and on a rare occasion the Elusive Glen of Imaal, to the Hunting Breeds of the Red/White & Red Setters, and the Irish Water Spaniels and their webbed toes. 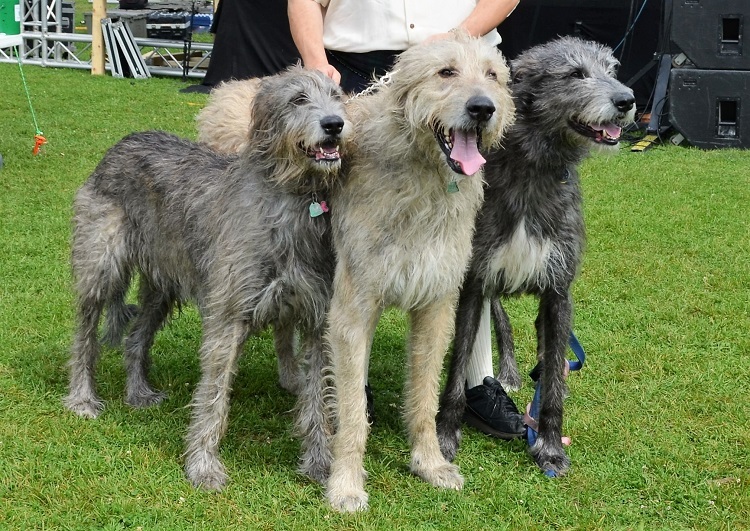 Lastly we always have a vast array of the Dog of Irish Kings and Nobles, the Gentle Giant, or Irish Wolfhound. Here you can come and ask questions of the Owners and Breeders about these magnificent animals. Once a day you can view them in stride as they take a turn around the grounds of the park, ending the “Parade of Dogs” at the children’s stage where you can hear the traditional uses of these dogs and who owned them. As well as dog etiquette in general!